Thread-leaf fleabane daisy has daisy-like flowers with white, pink or purple petals, and a large yellow center. Growing four to twenty inches tall, the stems are hairy and branch extensively, forming large symmetrical clumps. Individual stems may support one to several flower heads. The narrow light-green leaves, one half to three inches long, inspire the name, thread-leaf. 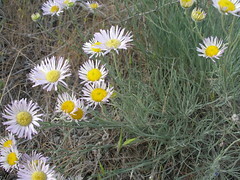 “Fleabane” comes from its reputation for destroying or driving away fleas. Native Americans drank a decoction of this plant for general illness, backache and cracked bones. The leaves were chewed for sore throats, or chewed up and spit on sores. Toasted leaves mixed with grease or mashed fresh plants were used as a salve for pains, sores, swellings, and wounds. The juice, sap, or thorns of these plants may cause a skin rash or irritation.